Hello, my name is Emily and I'm a self-proclaimed Ouizi mural addict. Louise Chen is the creative genius behind the beautiful floral murals around the city. Back when Andrew and I began dating and exploring the city together, I started to notice these beautiful, feminine florals painted on sides of buildings and in local coffee shops - the similarities between them was uncanny. I dug around a little bit and discovered they were all from Ouizi. I always smile when I discover a new one, like the beautiful flowers here on the side of Folk Detroit, or on the underpass of the Dequindre Cut. There's even a beautiful mural on one of the floors of my office! 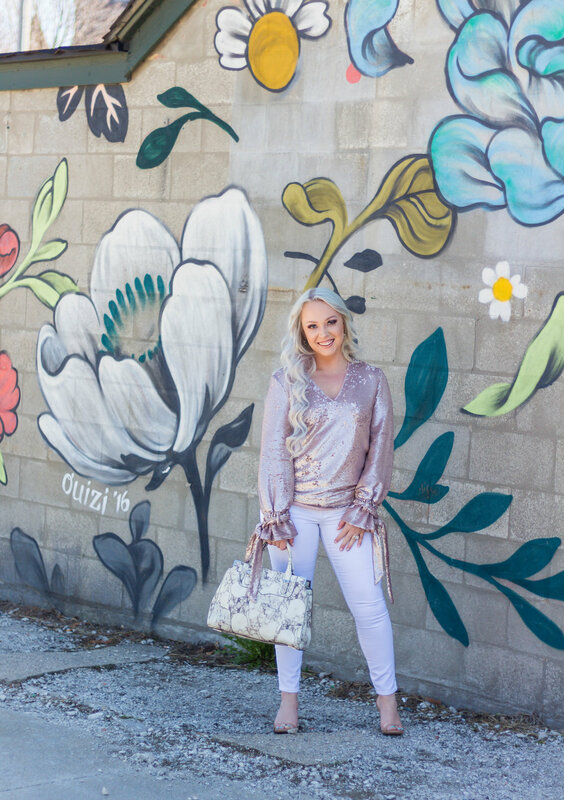 I couldn't pass up the opportunity shooting this feminine top in front of my newest Ouizi obsession in Corktown. 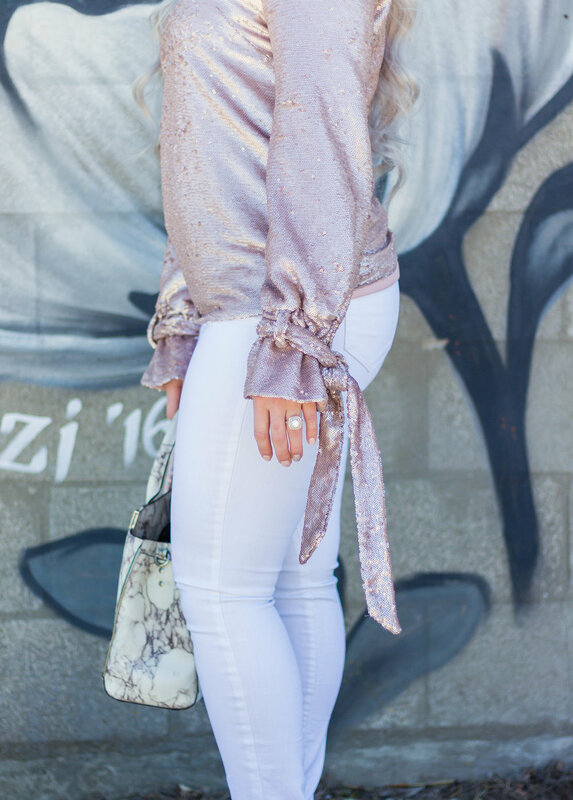 This top is actually one of my favorite Rent The Runway rentals thus far, and I just love the sleeve tie detailing. 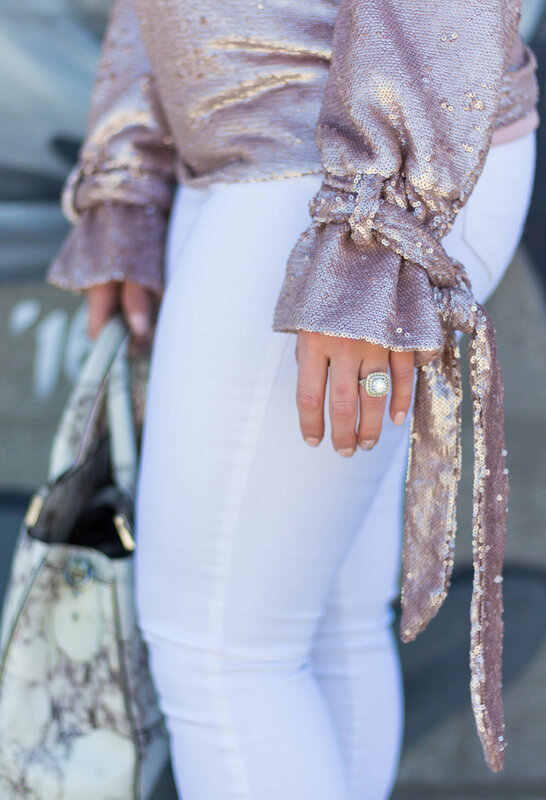 It's sheen in the sunlight is very lady-like, and paired with white jeans, it just screams spring. Although I didn't keep it, I have a feeling I might rent this top again when the right occasion arises. Would you be interested in seeing a series on the blog about some of the coolest murals around the Motor City? There are some real hidden gems all around town, and I'd love to share some of them with you for your own photos. Florals, patterns, historic, and abstract alike - they're all beautiful additions to Detroit!